Definition of Shaman: What is Shaman? A Shaman is a spiritual leader of a group or tribe who adhere to the belief in Shamanism. The belief and practice of Shamanism incorporates a range of beliefs, customs, ceremonies and rituals regarding communication with the spiritual world in which their religious leader, the Shaman, enters supernatural realms particularly when the tribe is facing adversity or need to obtain solutions to problems afflicting the community including sickness. The doctrine associated with Shamanism, that incorporates the role of the Shaman, is probably one of the oldest beliefs of man, with its origins probably dating back to the Stone Age. The term 'Shaman' is derived from the Sanscrit word "sraman" meaning a worker or toiler. Shamanism is not a specific religion but a doctrine based on a belief that physical nature might be brought under the control of man, in the person of a Shaman. The Shaman is believed to have a spiritual connection with animals, supernatural creatures and all elements of nature. The Shaman helps members of the tribe to identify personal Animal Totems that are spirit guides who walk through life with them and sometimes appear in dreams or Vision Quests or on a Spiritual Journey in the form of an animal. Shamanism is mixed with other beliefs such as Animism, Totemism, Ritualism, and Fetishism and these beliefs, taken as a whole, have strong religious connotations. Healer: The Shaman had Spiritual Healing powers and the ability to treat sickness caused by evil spirits - hence the Westernised name 'Medicine Man'. In many tribes, including the Cheyenne and the Sioux, the Shaman also had the role of the head warrior or war chief which made him the most powerful and influential man of the tribe. The belief in spirits and the ability of the Shaman to communicate with spirits was fundamental to Shamanism. The fundamental doctrine is based on the belief that every object in nature is controlled by its own independent spirit, or soul. Spirits inhabit the rivers, lakes, mountains, forests, trees, plants, sky, stars, sun, moon, animals, insects, fish, flowers and birds. Some spirits are good and help men who please them whereas other spirits are bad and liable to wreck havoc and harm on people and on tribes. It is the bad spirits that cause trouble, suffering, sickness, death and disease. If a Shaman had control over the spirits he became extremely powerful. The healing role of the Shaman was critical. Many Native American Tribes believe that when a man is ill a bad spirit has taken away his soul or has entered into him. It is therefore not surprising that the Native Americans would wish to gain power over these spirits. The man with knowledge of spirits and the supernatural was the Shaman. A Shaman would know protective words and chants and have knowledge of objects which, if carried, would disarm bad spirits and protect their owners. Such knowledge is what the Native Indians mean by �medicine� or �mystery.� The Native Americans who spent their lives in trying to gain such knowledge are referred to as medicine men, medicine people, mystery men, or Shaman. A shaman was equipped with a number of objects that helped him to communicate with spirits in other worlds. They used dances, gestures and sounds as the symbolic powers of Shaman to enter the spirit world. A Shaman also wore ceremonial clothes and carried sacred objects such as rattles and drums to incarnate the spirits of nature and amplify their power. The Shaman of some tribes also used masks that were believed to hold spiritual powers and would identify them with the spirits in other worlds and activate their powers. Among some tribes, notably amongst the Southwest Indians there are secret societies which practise spirit wisdom for the benefit of the individual, or for the good of the whole tribe. The Shaman secret societies may work to cure disease in individuals or work for the whole tribe to combat adversities. There were secret medicine societies of the Seneca, and of many other Native American tribes. 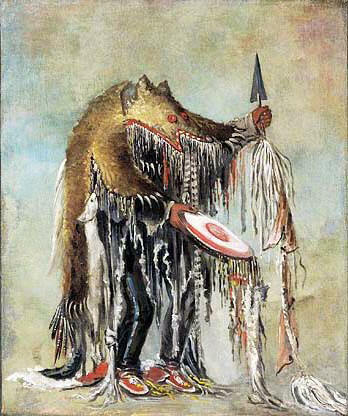 Each Medicine Society is dedicated to the Medicine of a particular earth spirit, such as the Wolf or the Bear. Among the Moki Pueblos, the societies of the Snake and of the Antelope carry on the Snake Dance which is ceremoniously performed so that the tribe may have rain for their fields. The Okipa is a sacred Sun ceremony of Plains People during which the Shaman would prepare the lodge and the participants for the ceremony which involved elements of fasting, torture and a vision quest or a plea or prayer to the spirits.